A leading global financial-technical firm announced plans Tuesday to establish a $283 million global headquarters for technology and innovation on the former University of Connecticut branch campus in West Hartford. The Seven Stars Cloud Group facility, which would create an estimated 330 jobs over the next five years, would be launched with $10 million in assistance from the state, Gov. Dannel P. Malloy said. The announcement came just 24 hours after the governor and officials at Stanley Black & Decker announced the planned construction Monday of a $1 billion, fuel-cell-powered, data center on the company’s New Britain site — a project expected to create about 3,000 direct and indirect jobs over the next decade. Listed on the Nasdaq exchange, Seven Stars Cloud assists financial services, manufacturing and other companies in the transfer of traditional financial asset records into digital ones. Plans for the West Hartford project are contingent, Malloy and Wu said, upon several factors, including sale of the former campus and approval of the project by local government agencies in West Hartford. West Hartford Mayor Shari Cantor — who also serves on the UConn Board of Trustees — said Tuesday she would not comment on the project until after UConn has resolved the proposed sale of the campus to Seven Stars Cloud. The trustees have scheduled a special meeting Friday to consider that sale. According to the meeting agenda, the negotiated sale price for the property is $5.2 million. There also are approximately $8 million in costs the company would have to bear to remove contaminants from the site. The 34-acre campus includes five buildings on the west side of Trout Brook Drive and another 24 acres that include parking and athletic fields on the east side. UConn has been actively searching for a new owner for the site. The governor said development of the new technology and innovation center would take an estimated six to nine months after site purchase and local approvals have been resolved. 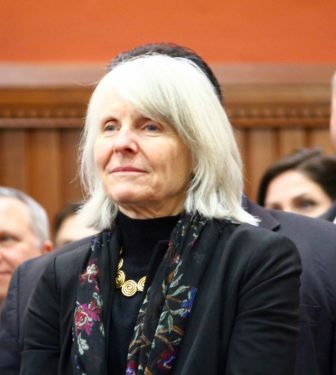 Connecticut’s economic development commissioner, Catherine Smith, said the state’s assistance comes in the form of a $10 million loan to the firm. A portion of the loan is forgiveable if the company achieves and maintains job creation benchmarks. Wu said Seven Stars Cloud officials anticipate keeping several of the existing buildings, though they would need to be renovated. There also would be additional landscaping work done on site. The company also anticipates constructing new buildings during future phases of development there. Wu recalled that the first students ever to leave China to study in the United States fled the Boxer Rebellion and settled in Hartford during the late 1800s. “It is in the spirit of these students that we will build a facility so modern and dynamic that it will attract the best talent and companies, making this site the blockchain capital of the U.S. and the world,” he said. Tuesday’s announcement is the second in two days — and the third in the past four months — of a major technology development in Connecticut. In addition to the New Britain project launched Monday, the governor announced in March that Infosys, an India-based information technology company undergoing a major expansion in the U.S., had selected Hartford as one of its new technology-and-innovation hubs, promising an estimated 1,000 new jobs to a city. 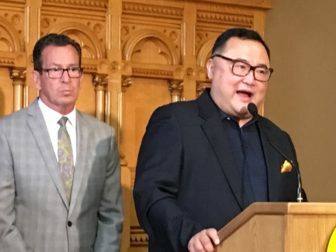 Malloy said his administration developed a vision for a Connecticut information technology cluster seven years ago when he first took office, but economic development and fiscal strategies had to be developed first. The governor said “that long-term vision is coming into full development,” then quickly corrected himself and added “I think there are going to be others” announced in the coming months.